Our composer of Serenade and San Biagio… for solo double bass died the 10-27-2012 in Dresden. 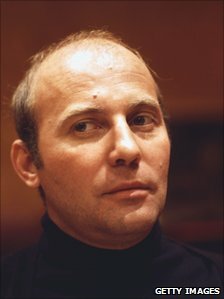 One of the most influential composers of the late 20th century, Hans Werner Henze was noted for his many operas, symphonies and ballets and for a commitment to political art which informs much of his work. 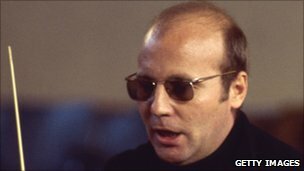 Born on 1 July 1926 in Guetersloh, Germany, the son of a schoolteacher, Hans Werner Henze was initially educated at schools with a socialist outlook. But, following the Nazi Party’s ascent to power in 1933, he lived a dual life. 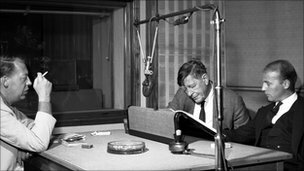 While dutifully studying the official curriculum at school, he played chamber music at a partly Jewish family house and there steeped himself in proscribed literature, including Mann, Wedekind and Brecht. He developed his greatest love, music, through listening to Bach and Mozart and playing the cello. In 1942, Henze entered the Brunswick State Music School, where he studied piano, percussion and musical theory. 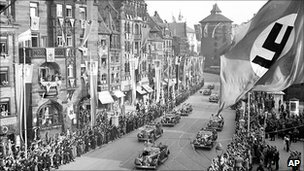 Even so, the modern repertoire hardly ever intruded into a wartime milieu dominated by German Romanticism. Henze’s father was killed on the Eastern Front and Hans was conscripted into the army in 1944, ending the war in a British prisoner-of-war camp. His experiences left Henze with a lifelong hatred of fascism which informed much of his work. It was only after the war, studying in Heidelberg, that Henze first heard composers like Bartok, Berg and, most importantly, Stravinsky. He also composed his first work, the 1946 baroque-style Kammerkonzert, which won him a publishing contract. The following year came the first of Henze’s 10 symphonies, a neo-classical work featuring a viola solo. Commissions soon mounted, most notably for stage music. Henze composed ballets – including Jack Pudding and Georges Dandin – and operatic works, like Boulevard Solitude. In 1953, seemingly overloaded with work, and jaded with intolerant attitudes towards his homosexuality, Henze moved from Germany to the Italian island of Ischia in the Bay of Naples. That year he completed Ode an den Westwind, a cello concerto based on Shelley’s iconic series of sonnets. He enjoyed a fruitful collaboration with the Austrian poet Ingeborg Bachmann, most notably with Prinz von Homburg (1958), an adaptation of Heinrich von Kleist’s powerful psychological play. Henze also enjoyed great success with the opera Elegy for Young Lovers, penned by WH Auden and Chester Kallmann. In April 1964, Henze received the accolade of having all of his first five symphonies performed by the Berlin Philharmonic Orchestra under Herbert von Karajan, together with the premiere of his opera Being Beauteous. From the mid-1960s onwards, Henze’s work took on an explicitly political tone. The oratorio, Judische Chronik, was followed by a fugue, In memoriam: Die Weisse Rose (the White Rose), dedicated to the young anti-Nazi martyrs Hans and Sophie Scholl. After students hung a red flag from the conductor’s podium, both the orchestra and choir refused to perform. The ensuing riot, while perfectly in tune with the spirit of the times, did nothing to enhance Henze’s reputation. Shrugging off criticism that he was an armchair revolutionary, Henze premiered his Sixth Symphony in Havana, Cuba. In 1973, his avowedly political Voices features 22 revolutionary poems and drew comparisons with Kurt Weill. In recent years, Henze’s works took on a more reflective mood. His Requiem (1990-92) was a moving, wordless, meditation of life, death and war. Classical themes also came to the fore, for instance in the theatrical Venus and Adonis (1993-5). Hans Werner Henze mixed neo-Classical themes with a decidedly modernist approach. But underlying all his many works – symphonies, operas, concertos, oratorios and ballets – was a refreshing subversiveness born of his hatred of Nazism. In this way, Henze was as important as a chronicler of the darkness of the 20th century as he was as a musician.